Located at the south end of Second Avenue, standing proud and alone with his back to the lake and watching over the Town of Gimli. The Viking Statue was a centennial project taken on by the Gimli Chamber of Commerce in 1967. The huge monument stands a skyward looking 15 feet tall, with a cost of $15.000.00 to build. It was designed by Gissur Eliasson, a Professor at University of Manitoba and sculptured of fiberglass by Italian Canadian sculptor George Barone. It was unveiled July 30, 1967, by that year's guest speaker of the Icelandic Festival, Asgeir Asgeirson, and assisting him was Frank Cronshaw, the president of the Gimli Chamber of Commerce. The Viking Statue is one of the main attractions to all who visit Gimli. The New Iceland Heritage Museum (NIHM) is an national museum dedicated to telling the story of New Iceland and the Icelandic experience in North America. Many artifacts, books, clothing, and photos can be found in the Museum, a must see when visiting Gimli. With 3 locations: The Waterfront Centre (94 - 1st Avenue), Gimli Public School 1915 (62 - 2nd Avenue) and Lake Winnipeg Visitor Centre, (near Gimli Harbour). You can also visit the NIHM online. 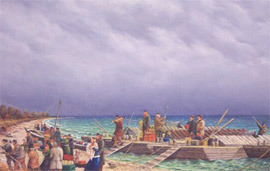 Located on the south end of First Avenue, it was presented to the Town of Gimli by the officers and men of Canadian Forces Base Gimli. Commemorating 28 years of friendship and co-operation, the monument was a gift from the Canadian Forces Base which closed September, 1971. In June, 1971, airforce equipment erected the "T-Bird" atop a heavy concrete pillar set 17 feet in the ground. It was formally presented to the Town on July 17, 1971, by Colonel Jim Dunlop. The Gimli Yacht Club is situated on the Southeast end of First Avenue, in the Harbour Area; it was the site of the 1967 Pan American Games. The club provides an active competitive sailing school on Lake Winnipeg. 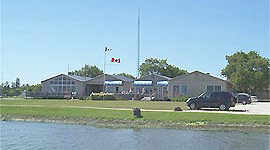 Sailors from all over Manitoba regularly spend their leisure hours sailing from the facilities offered by the Gimli Yacht Club. 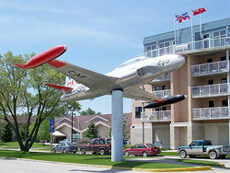 Located on First Avenue, a half block south of Center Street, it was a 1967 Centennial project of the Royal Canadian Legion, Gimli Branch. This attractive stone and brick cenotaph is dedicated to the fallen in World Wars and the Korean War. Designed and built by a local artisan, Leonard Ciszewski, it was unveiled and dedicated in a solemn, simple ceremony as part of the Remembrance Day Service on November 11, 1967.